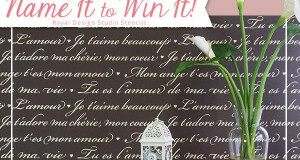 Home / News / Contests + Giveaways / New Pretty Damask Stencil: Name it to Win it! The winning stencil name was Love Birds Lace Damask Stencil suggested by Jenna Bolton. Find the Love Birds Lace Damask Stencil on Royal Design Studio. We LOVE designing and introducing new stencil patterns and we are especially excited about this beautiful new damask stencil pattern that is filled with fanciful birds and flowers. 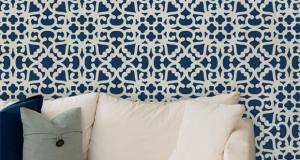 It is reminiscent of our folk-inspired Otomi patterns in our Latin American Stencils Collection. The only problem is… we haven’t quite come up with the perfect name. That’s where YOU come in! From the awesome response to last week’s ‘Name it to Win it’ stencil contest, we figured that you guys could help us come up with the perfect name for this pretty allover damask stencil pattern! So here you go! Put your creative thinking cap on and leave your best stencil name suggestion in the Comments section here before midnight on Sunday, June 15. If we chose your name we will send you the stencil with our compliments. Good luck!